In this topic you will learn how to manage viewer data in the Audience module. 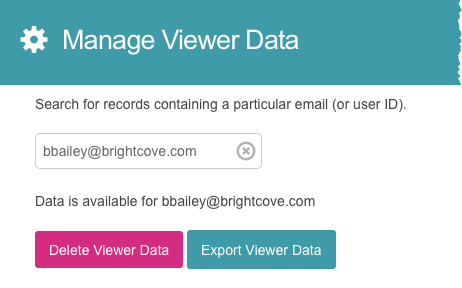 The manage viewer data option allows you to search for a user and then either remove that user or export that user's data. Typically when integrating with a marketing automation platform (MAP integration) the data retention period setting is used to control how long data is retained. Note: You must be an account administrator to access to the Manage Viewer Data menu. To manage viewer data, follow these steps. Click Manage Viewer Data in the left navigation. Export Viewer Data - Export the lead and view event data for the user. The lead data will contain the data that was entered into an Audience lead form. The view event data contains all of the view events for the viewer.